Horses are large and powerful, which creates a natural opportunity for some to overcome fear and develop confidence. The size and power of the horse provides for wonderful metaphors when dealing with other intimidating and challenging situations in life. Horses are very much like humans in that they are social animals. They have defined roles within the herds. They would rather be with their peers. They have distinct personalities, attitudes, and moods. An approach that seems to work with one horse, does not necessarily work with another. At times, they seem stubborn and defiant. They like to have fun. In other words, horses provide vast opportunities for metaphorical learning. Using metaphors, in discussion or activity, is an effective technique when working with even the most challenging individuals or groups. Most importantly, horses have the ability to mirror exactly what human body language is telling. Many people will complain, “The horse is stubborn. The horse doesn’t like me,” etc. But the lesson to be learned is that if they change themselves, the horses will respond differently. Horses are honest, which make them especially powerful messengers. 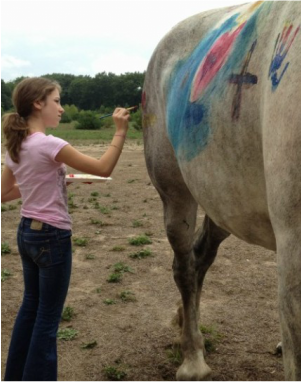 In addition, recent studies conducted by the Institute of HeartMath provide a clue to explain the bidirectional "healing" that happens when we are near horses. According to researchers, the heart has a larger electromagnetic field and higher level of intelligence than the brain: A magnetometer can measure the heart's energy field radiating up to 8 to 10 feet around the human body. While this is certainly significant it is perhaps more impressive that the electromagnetic field projected by the horse's heart is five times larger than the human one (imagine a sphere-shaped field that completely surrounds you). The horse's electromagnetic field is also stronger than ours and can actually directly influence our own heart rhythm! Horses are also likely to have what science has identified as a "coherent" heart rhythm (heart rate pattern) which explains why we may "feel better" when we are around them...studies have found that a coherent heart pattern or HRV is a robust measure of well-being and consistent with emotional states of calm and joy–that is, we exhibit such patterns when we feel positive emotions. A coherent heart pattern is indicative of a system that can recover and adjust to stressful situations very efficiently. Often times, we only need to be in a horses presence to feel a sense of wellness and peace. In fact, research shows that people experience many physiological benefits while interacting with horses, including lowered blood pressure and heart rate, increased levels of beta-endorphins (neurotransmitters that serve as pain surppressors), decreased stress levels, reduced feelings of anger, hostility, tension and anxiety, improved social functioning; and increased feelings of empowerment, trust, patience and self-efficacy."